Actually item 1267 seems to the the special of the day, every day. What’s 1267? It’s the United Nations Hazardous Materials Descriptions and Code for “Petroleum crude oil”. 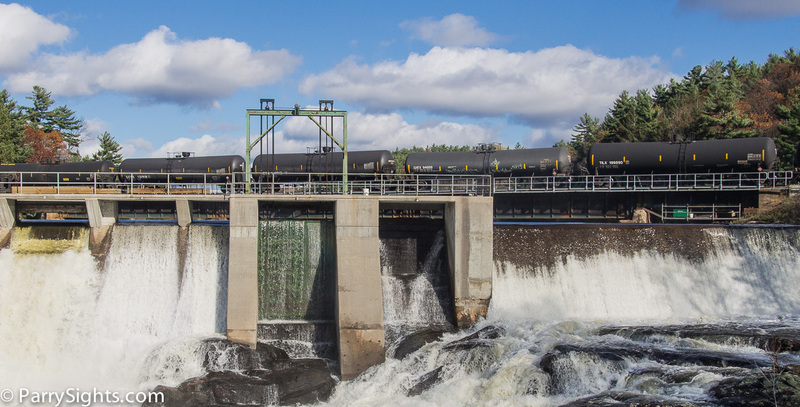 These photos were taken today, October 23rd, as I was walking past the Cascade Street dam. In total I estimate there were perhaps 40 or more tankers being pulled by a pair of CP engines. How could I tell it was hazardous material 1267? You can read the numbers off the labels that are affixed to the sides of the tankers as they roll through town (the red squares turned 45 degrees). in this case I was too far away to read the numbers directly but the photographs reveal what I couldn’t see. It’s ‘fun’ to watch the various tanker cars roll by and take down the hazmat numbers and cross check them with the UN codes. It’s scarier than anything you’ll see this Hallowe’en. 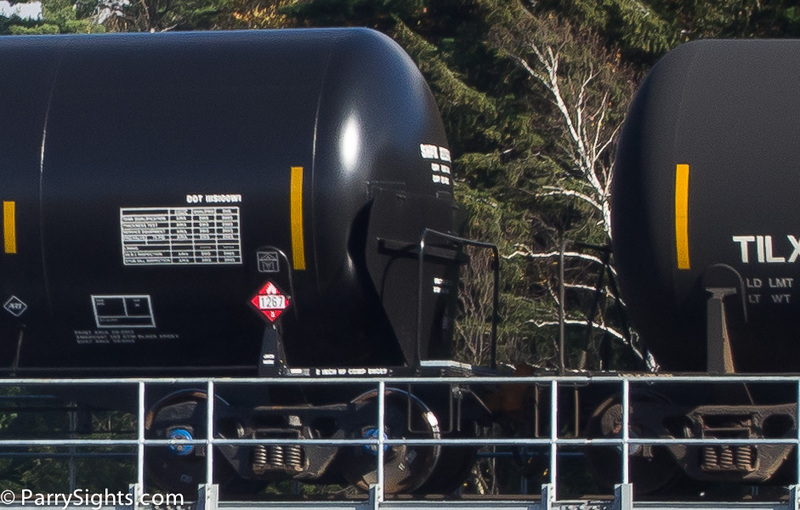 You have photographed CP 608 – a dedicated crude petroleum train. For Canadian National, train # 314 & 316 haul the full 1267’s from out west & CN 301 takes back the empties. On Canadian Pacific they have a dedicated train CP 608 that brings the full tankers & CP 609 takes them back. There is a LOT more crude being hauled back & forth in the last couple of years.